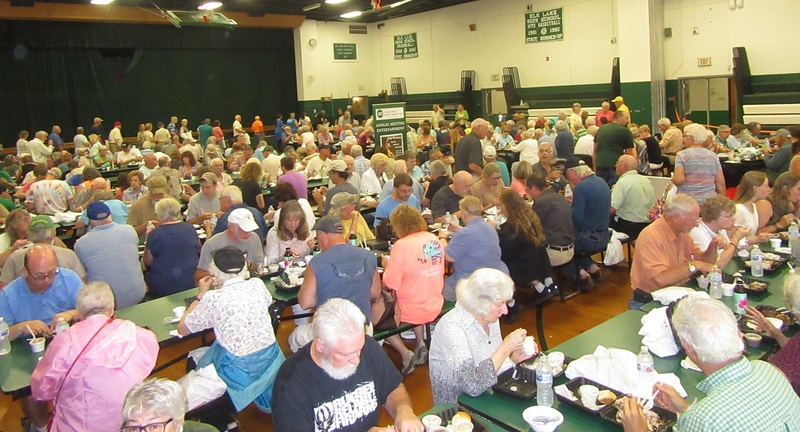 At least 900 people moved through Elk Lake High School on July 17 and enjoyed a chicken dinner as guests of Claverack Rural Electric Cooperative. Nathan Stoddard, a Claverack field service supervisor enthralled guests with demonstrations of how the rural electric cooperative has integrated various technologies to provide quicker response and less down time for members in the event of outages. Claverack Rural Electric Cooperative officials estimate that more than 900 people attended this year’s annual meeting held on July 17 on the Elk Lake school campus. In addition to exhibits, entertainment, door prizes and a meal prepared by culinary arts students from the Susquehanna County Career and Technology Center, many guests also participated in the annual reorganizational meeting that concluded the event. 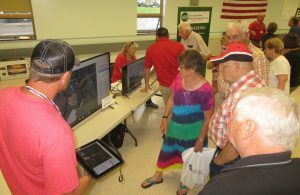 Guests were impressed by discussions and demonstrations about upgrades in technologies, as well as operations and engineering highlights to improve service to their residences and businesses throughout parts of eight counties that receive services from Claverack. Field service supervisor Nathan Stoddard commanded an attentive audience throughout the afternoon with his demonstration of new GPS tablets that are standard equipment in every company vehicle. The hand-held devices provide details to both linemen and those making service calls for which they would previously have had to make a call to the office, such as the location of fuses, where the electricity enters each home, and how many other other customers might be affected by a single outage. “It was interesting to see how much data they carry with them,” said John Host (above, left) of Auburn Township. “Having that in the truck is so much handier than having to go back to the shop and look it up.” Host referenced his former career and HVAC certification and how helpful such gadgets would have been to him. He was attending his first Claverack meeting and enjoying dinner with two other first-timers, John Picotti (center) and Shirley Wood. “I was pretty impressed with what they’ve done with the power grid and the GPS,” added Piccotti, who learned that, if a pole is damaged, a customer simply relaying the pole number to Claverack can decrease the response and repair time and scope of disruption due to the volume of information stored with each pole number. Susquehanna County highlights since last year included the inspection of 2,210 utility poles and replacement of 43, the assignment of new apprentice lineman Troy Ely to the Montrose District, and the completion of design and start of construction of a three-phase tie line for the Steinbach and Hop Bottom substations. The eight-mile three-phase line, mostly in Harford Township, will also provide backfeed to commercial and residential customers in the South Gibson area. Dead ash trees are a major issue throughout Claverack’s vast territory and are being dealt with systematically. The company has contracted with ACRT, a utility vegetation management firm, to take the lead role in overseeing the co-op’s right-of-way management program. 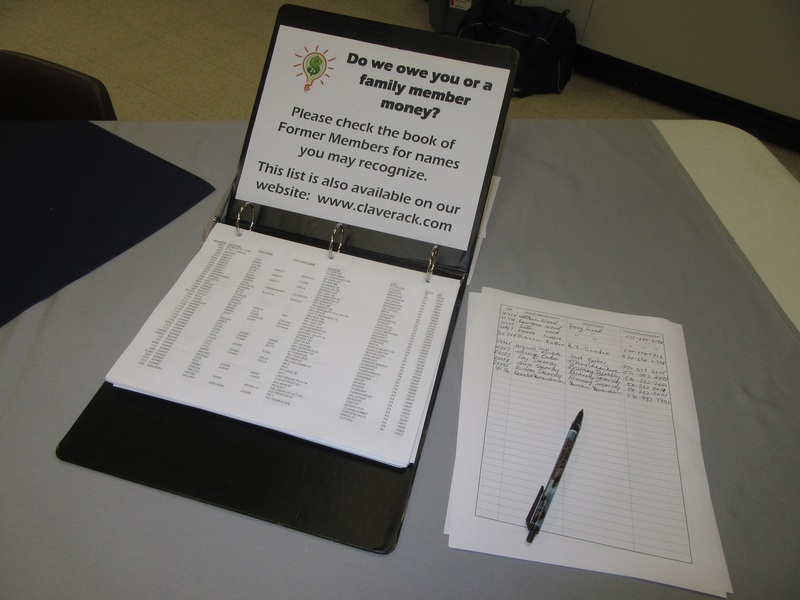 Numerous guests took the time to look through a ledger (above) maintained by Claverack of member accounts that were never properly closed out. Claverack owes hundreds of former customer money and wants to get it back to them or family members. “It’s primarily people who have moved away without leaving a good mailing address,” marketing services quality specialist Karen Evangelisti explained. “And, in some cases, they’ve passed away.” The information is always available online at Claverack.com. 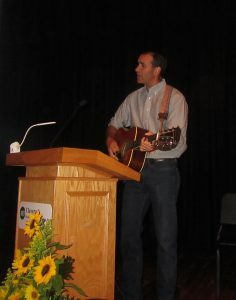 Storms moving through the area made the halls of the school building a bit stuffy, but guests found relief in the air-conditioned auditorium where folk musician and historian Van Wagner (below) sang a variety of tunes that he had composed by himself and with others. The buoyant ditties belied their sometimes serious undertones, covering topics like bootleg miners, the controversy over whether or not mountain lions still exist in Pennsylvania, the Walking Purchase by which colonial settlers acquired much of their lands from the Native Americans, and Interstate 80’s role as a cultural divide in Pennsylvania. Wagner also led a discussion on the Susquehanna River’s white pine rafting era from the 1700s to 1800s. The business meeting, conducted primarily by Claverack board chairman James Luce of Laceyville, included the re-election of Luce and Gary Hennip of Rome to represent Zones 6 and 4, respectively. The Zone 5 post, covering much of northwestern Susquehanna County, remains open as the sole candidate withdrew his name from the ballot over questions of residency requirements. Luce was also re-elected as board chairman. Others re-elected to their respective positions included Chuck Bullock of Auburn Township as board vice chairman, Steven Sliwinski of Troy as secretary/treasurer, and Danise Fairchild of Wyalusing as vice secretary/treasurer. 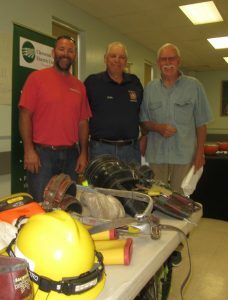 Tunkhannock lineman Bucky Camburn (above, left) explains the wide array of apparatus on display at Elk Lake High School on July 17 to John Miner (center) of East Rush and Norm Kahle of Dimock.